Thanks to Thomas Hasch for sharing this! “Windsurfing is a great sport. I have many fond memories of reaching warp speeds, jumping to the moon and racing down mountains of water and sailing in high winds. But none of the those “extreme” and by many considered desirable conditions come even close to the pure enjoyment of sailing in 12knots of wind on a Sunday afternoon next to my kid. I still hear the laughter and joy in my ears right now. I am truly blessed and I know that many dads would love to share their favorite sport with their kids. Yet at the same time I see the same “parental windsurf mistakes” repeated over and over again. Below are 8 personal experiences that made our kid love windsurfing. The list is by now means complete, nor do I claim to be an an expert on any topic – but I can claim that my kid asks me to go windsurfing and not the other way around. Wait until your kid(s) ask you if they can learn. They really need to want to learn how to windsurf. Don’t try teaching your own kids – even if you are an expert. Sign them up for lessons. Group lessons are often very affordable and your kids learn with other kids which increases the fun factor. Get specialized kids gear – it is cheaper than you think. Do not have them use your “small” wave sails they are way too heavy. Wide boards are Fun. Give wide floaty boards a try. Don’t be afraid of larger pure “Freestyle” boards. 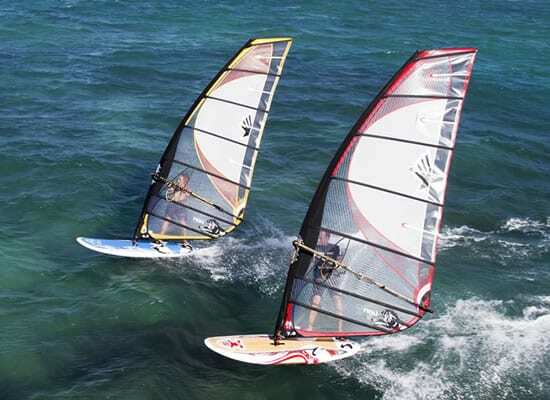 They make for great light wind sailing for adults and are great beginner boards for lighter kids. Learning to windsurf is emotionally exhausting for your kids. They want to make you proud. Let them be kids. Let them play with just the board and float around at their leisure. Remember they are kids – 30 minutes of windsurfing for them is the same as 3 hours for you. Be happy and encourage short sessions. Better to have 15 minutes of fun as compared to 2 hours of agony and your kid never wanting to do it again. When sailing next to your kids use an easy to handle sail such as the Ezzy Panther Elite or Tiger. Do not use your 5 Cam racing sail. You’ll be battling with your gear rather than enjoying the moment.